Panettone is a typical sweet bread of Milan, usually prepared and enjoyed for Christmas and New Year around Italy, and is in fact one of the traditional symbols of the city. When we lived in Milan we were told of a famous pasticceria that has been using the same recipe to make their panettone for generations. You had to book how many you would like to order and they would give you a date to come pick them up. I remember being very impressed with their version of this famous Milanese sweet bread as it was quite rustic in appearance but had a delicious, unique flavor. Typically, panettone is a round shaped bread with a cupola shape dome top and weighs about 1 kg. The process to make this bread often requires a long proofing that can take several days which gives the bread it’s light texture. Traditionally, panettone contains candied orange, citron and lemon zest, as well as raisins, which are added dry and not soaked. It is usually served in slices, accompanied with sweet hot beverages or a sweet wine, such as Asti or Moscato. You can do a lot with a basic panettone including cutting them in layers and filling them with cream mousse fillings or even gelato. Giving a good quality panettone as a hostess gift is quite common over the holiday season often resulting in us having more than we could eat over the holidays. I learned to use my delicious leftover panettone in many ways, including using it to make a creamy bread pudding, a layered mousse cake, or simply in this easy French Toast Recipe With Caramelized Apples which is perfect for a leisurely holiday brunch. This bread is already sweetened and flavored so I do not add any additional spices or ingredients to sweeten it. 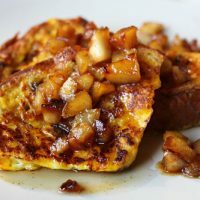 My favorite way to serve this French Toast is with a spoonful of my Caramelized Apple Compote (recipe below) although it is delicious also with a drizzle of warm maple syrup, or even simply with powdered sugar. 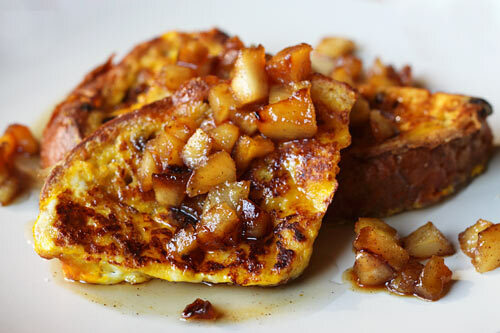 You can make the apple compote the day before but it is best to re-warm it before serving on the french toast. A great way to use up leftover panettone. The night before, cut the rounded dome off the panettone and set aside and cut the rest of the loaf into 1 inch slices horizontally. Cut each slice into four quarters, then set aside on a baking sheet to dry. The next morning, preheat the oven to 325 degrees F.
Beat together the eggs and milk until light, and pour into a shallow bowl. Melt some butter over a large skillet on medium low heat, adding as many slices of bread onto the skillet as will fit at a time. Fry until lightly browned on both sides, flipping the bread when necessary, and ensuring the bread is cooked through. As each batch is cooked, place on a warmed tray in the oven while you continue to cook the rest of the french toast. For the apple compote, in a large saucepan, combine the butter, sugar, vanilla bean, cinnamon, nutmeg, and salt and heat until sizzling. Add the apple, then lower the heat and simmer, stirring occasionally, until the apples are very tender and the mixture thickens and browns, about 15 minutes. Add a little water if mixture begins to burn.